Diving underwater can be a surreal experience. Diving is one of the few adventures that transports you to a totally alien environment, one that is naturally devoid of human life. Unfortunately, the ocean world is far from free of our influences and finding pristine conditions is often limited to remote areas far from human civilization. However, there are still many places in the world where diving can be an amazing experience on any given day. Since I was young I have been fascinated with the ocean and spent many hours watching my favorite TV shows such as Sea Hunt, Voyage to the Bottom of the Sea, Johnny Quest, and of course, the Undersea World of Jacques Cousteau. After I started surfing in 1970 I always wondered what it was like to be underwater for extended lengths of time and cruise around. Seven years later, I because SCUBA certified in the Philippines while my Dad was stationed at the Subic Bay Naval Station and my life was forever changed. At Subic I experienced 100 feet visibility, coral reefs, and some amazing places. When I returned to college in Central California from the Philippines I was faced with 1-10 foot visibility (on good days) and cold water. However, I was so passionate about diving I used to sit in 5 feet of murky water with a tank of air for hours just looking at the bottom and sea life. Ah, those were the days. Me SCUBA diving at Puako, Hawaii, 1995. Photo by John Coney. At any rate I went on to a long career in marine biology and over 1,000 Scuba dives in California, Oregon, Washington, Mexico, French Polynesian, Indonesia, Micronesia, the Philippines and Hawaii. Although there are so many memorable dives that I could write about here, one stands out over the years that I keep thinking about. 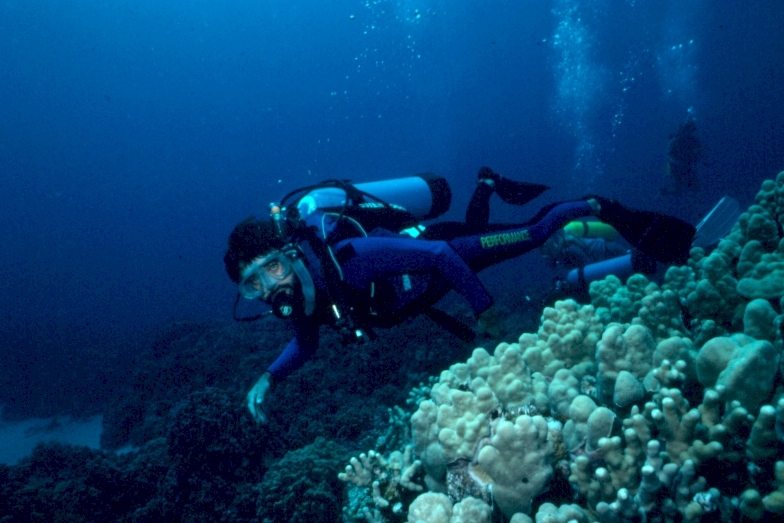 When I lived in Hawaii (on the big island) I often went diving on Kauai with my friend and colleague, Carl Stepath; a marine biology professor at Kauai Community College and Founder of the NGO Save Our Seas. Carl lived on the north shore of Kauai at Haena Beach and adjacent to some spectacular diving spots. One summer morning in 1999 we got up early and went diving at Tunnels, a popular dive and surfing spot and a dive I’ll never forget. It was a very calm and clear morning with the sun just rising in the east. As we walked into the water against a spectacular backdrop of island mountains I knew this was going to be a great dive. Since it was early and we were the only people on the reef the fish and turtles were undisturbed, dare I say “sleepy” and easy to approach. I had my Sony VX1000 video camera in an Iklelite housing (then state-of-the-art digital equipment) and wanted to film the reef “as is” with no humans in the frame, just focusing on the reef and its inhabitants. To enhance the mood I used music by George Winston of one of my favorite Doors song “Crystal Ship” on his “Night Divides the Day” album. I’ll let the video speak for itself but it was a surreal dive and one I still dream of often. The sun reflecting off of the surface, the ring tail surgeonfish milling about, the turtles “waking up” and swimming to the surface, mixed schools of surgeonfish feeding on the shallow reef. This is what I imagine the reef to look like without people around. But of course that is impossible to know! So what about the sharks you might ask? Well, two things: one, this is a common place to see white-tipped reef sharks which rest during the day in the caves under the reef. They are relatively small and not aggressive towards humans and this is a great place to see them; second, this is the very place that Bethany Hamilton was attacked, and lost an arm, from a Tiger shark in 2003. As you hopefully have heard, Bethany survived and made an amazing recovery documented in the film Soul Surfer; an inspirational film which illustrates the power of faith in the face of tragedy to transform one’s life into a motivational experience. Of course, hearing this you may not be rushing out to dive at Tunnels anytime soon so here is some data to keep in mind. First of all, shark attacks are relatively rare, even in Hawaii. According to the SAS Shark Attack file, since 1908 there have been 238 shark attacks In Hawaii, with 27 off Kauai and 9 of those off the north shore not far from tunnels, one being fatal (in 1981). So overall, the chances of an encounter, let alone a fatal attack are very, very small considering the millions of people that play in the ocean each year. Moreover, thanks to Dr. Kim Holland and his crew at the University of Hawaii who have been tagging tiger sharks in Hawaii and tracking their movements via the Hawaii Tiger Shark Tracking Network we know that these large predatory fish travel far and wide in search of prey. As an example see the map below of a female tiger shark over a 10 month period swimming all over Maui and over to the big island. So the chances of an encounter are serendipitous at best. 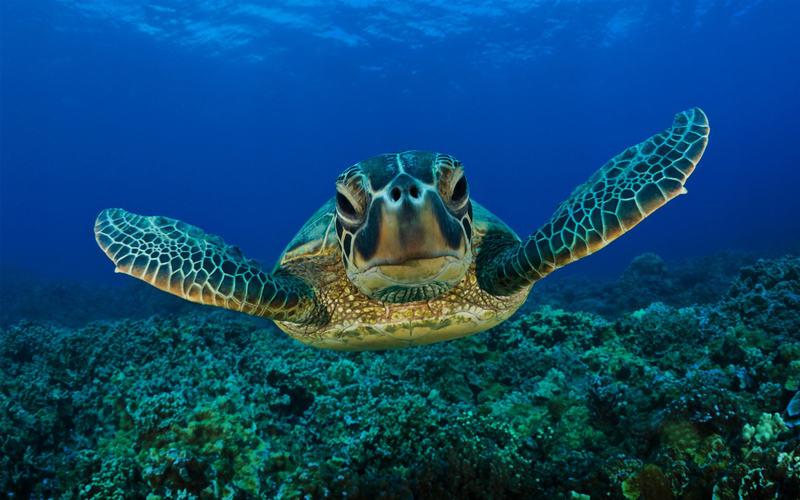 Of course sea turtles, which are on the rebound in Hawaii, are know prey of tiger sharks, so swimming in areas where their are lots of turtles may increase your chances of seeing a tiger shark, however slightly. Track of tagged tiger shark (12.2 ft. female) between Oct 18, 2013 and Aug. 8, 2014. 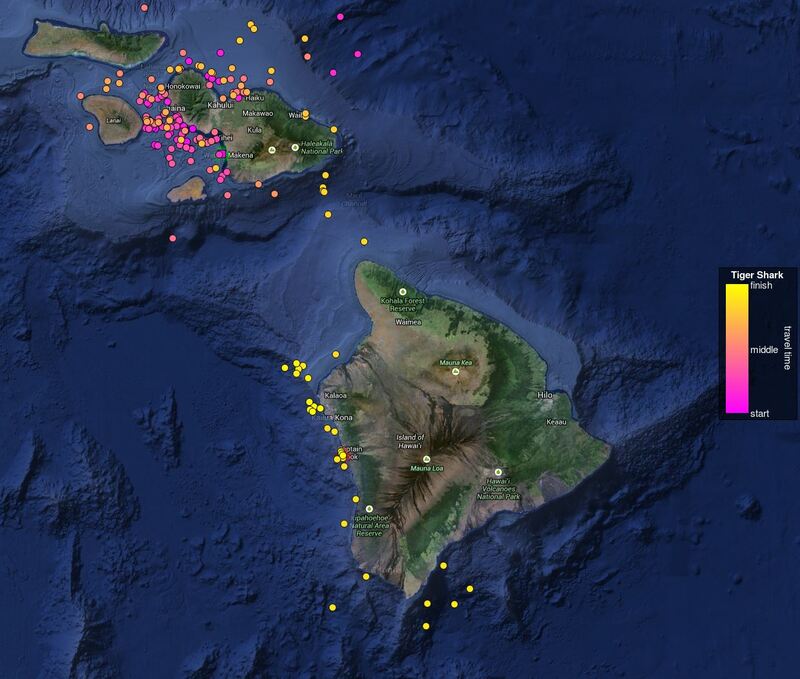 Data from Hawaii Institute of Marine Biology. At any rate, here’s the video and I’d love to hear your comments. Enjoy! Long have the days passed of Onekahakaha and Kapoho tide pools. Revisited them in 2010 and still became excited. Being in Las Vegas don’t offer a lot of snorkel or diving… Went to Broracay Island in 2012 and was saddened by the lack of pristine waters. Humans have done a huge disservice to marine ecosystems worldwide. Thanks for the blog to jog memories of the Big Island! These were great times Brett and very fun places. Glad you enjoy my blog — stay tuned! This reminded me of some happy memories of surfing and snorkeling at Tunnels. I loved watching the turtles and monk seals.